I’ve got to back track a little bit here. Around 4 years ago, Bo and I bought our first bed. We got a ridiculous deal on a fantastic mattress, and we bought an Ikea bed to put it in at the new condo. Now, I wasn’t a fan of that bed. I always thought it was too low to the ground (damn platform beds being in style), but it served its purpose. Until one day when one of the side rails pulled out of the particle board frame and half of the mattress ended up on the floor. A few super duty screws later though, and we were back in business until we moved. When we moved out of the condo, Bo broke just about every piece of the bed trying to take it apart. I still think it did it on purpose, because he knew I didn’t like it. I certainly had a smile on my face when we threw that puppy in the dumpster, and while I believe Ikea is fantastic for a lot of things, I vowed to never own another Ikea bed. Never. We started bed shopping while our house was being built, and I fell absolutely head over heels in love with an upholstered bed frame. It was like a giant wingback chair was transformed into a bed. I pictured it with mirrored side tables, and smokey grey/green paint with my silk drapes. It’s a vision, it really is. The bed though…it was $1500. Insane, at least for us. But we kept going back and looking at it, and I kept falling more and more in love with it. Then the store was having a sale, we would save $500, still ridiculous, but we could probably find a way to manage it, so off we went. But they raised the price. And I walked out of that store, knowing that I would never, ever, own that bed. We pretty much walked straight into Ikea, and for $300 we found something that was at least raised off the floor (buh bye platform), and a couple of matching side tables (buh bye mirrored dreams). A few months ago, Bo mentioned off handedly that the bedframe seemed to be pulling apart in one spot. He said he banged it back together though. We both forgot about it, no more issues. Exactly 1 year to the day from the first night we spent in this bed. Bo: You broke the bed. Me: What? I didn’t break the bed? My side is still up, YOU broke the bed. Bo: I didn’t break the bed, my side’s still up. So, the headboard is in about 5 pieces; sides split from frames, split from tops, split from bases. The bottom of the headboard split right in half where the support bar attached, and the sides are a little rickity, though still intact. That’s how the center of the bed ended up of the floor, but both sides were still up in the air. What a way to wake up. Truth be told, I’d woken up at 4:11 and was fighting the urge to get up and pee. I kinda wish I had so that Bo would have broken the bed on his own, it would have made my argument better. We pulled the mattress onto the floor at the edge of the bed, and as I crawled in beside Bo, I vowed, to never own another Ikea bed again. 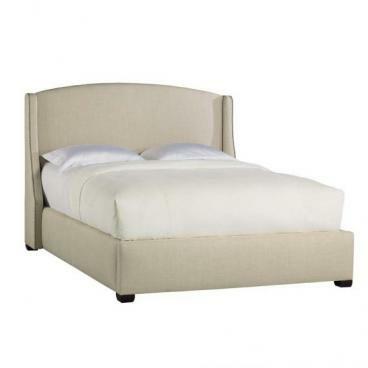 PS – Here’s the bed that I fell in love with. I really liked the black four poster one too, but I could convince Bo to go for it….it was cheaper though…maybe I’ll have better luck this time!